Paul is a Chartered Engineer and his main field of activity within the firm is Quality Standards, Procedures & Health & Safety. Paul was responsible for achieving our Occupational Health & Safety Management Systems ISO 18001 and Environmental Management Certification ISO 14001 in 2015. Paul also maintains and leads our in house quality procedures and regular meetings with external, auditors to demonstrate the company ISO is compliant with International Standards. 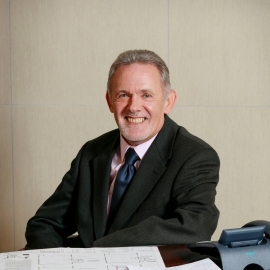 Paul has been Project Director for a number of major, education and healthcare projects. Paul was involved on a number of capital projects ranging from Eircom Corporate Headquarters in Dublin and Vodafone Corporate Headquaters in Central Park, Dublin. Paul is involved in all our Health, Safety and welfare procedures and assessments, Guiding staff on their responsibilities on all construction projects. Paul also leads & arranges all CPD Training within J.V Tierney & Co on a yearly basis.